'Cars 2,' 'Cars 2 - 3D' and 'Cars: Director's Edition' Announced and Detailed for Blu-ray! The latest addition to the Pixar lineup will be racing to store shelves in an assortment of high-definition flavors this November! Celebrating the 25th anniversary of Pixar Animation Studios, the high octane in-home release invites families and fans of all ages to come along on a journey around the world with the #1 animated film of the year and introduces an exclusive all-new animated short 'Air Mater,' featuring the fan favorite character spinning his tales in an exciting adventure high above Radiator Springs. The must-own animated release also includes fascinating commentary from award-winning director John Lasseter and “Hawaiian Vacation,” the delightful animated short that accompanied the film in theatres. The immersive 'Cars 2' bonus features include an one-of-a-kind interactive “World Tour” map that takes viewers through nine different locations, including those featured in the film and more. A global thrill-ride, it allows viewers to go behind-the-scenes with the Pixar artists and filmmakers as they circle the globe finding inspiration for the most international of all Pixar films to date. 'Cars 2' is also the first Pixar film to be released in spectacular Blu-ray 3D. Academy Award®-winning filmmaker John Lasseter, chief creative officer for Walt Disney and Pixar Animation Studios, returns to the driver’s seat as director. 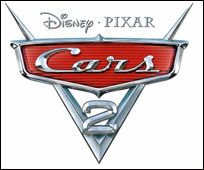 'Cars 2' is produced by visual effects industry veteran Denise Ream (associate producer, 'Up'; visual effects executive producer, 'Star Wars: Episode III — Revenge of the Sith'). Oscar®-winning composer Michael Giacchino ('The Incredibles,' 'Up') provides the electrifying score with a surf-rock-meets-spy-thriller flavor and a variety of global accents, evoking a sense of thrills, mystery and emotion. Brad Paisley, Robbie Williams, Weezer, French singer Bénabar and Japanese girl band Perfume lend their diverse musical talents to the film’s soundtrack. The film features an all-star vocal cast including Owen Wilson who reprises his role as hotshot racecar Lightning McQueen. Larry the Cable Guy provides the voice of Mater (proprietor of Tow Mater Towing and Salvage), Lightning McQueen’s best friend and the heart and soul of Radiator Springs. Bonnie Hunt is back as Sally, the baby-blue Porsche 911 Carrera whose motor races for Lightning. Acclaimed actor Michael Caine makes his Pixar debut as Finn McMissile, a top British spy who mistakes Mater for an undercover American agent with a genius disguise. Emily Mortimer brings charm, cleverness and cachet as Holley Shiftwell, a rookie field spy who knows every trick in the manual. Versatile actor John Turturro gives a free-wheeling performance as Francesco Bernoulli, the world-renowned Italian racing champ who is Lightning’s chief rival. Tony Shalhoub, Joe Mantegna, Peter Jacobson, Jason Isaacs, Eddie Izzard, Paul Dooley, Cheech Marin, John Ratzenberger, Franco Nero and Vanessa Redgrave also lend their vocal talents. Real-life Formula 1 racing champ Lewis Hamilton and NASCAR racer Jeff Gordon add a touch of authenticity with their cameos in the film. The film will be available in a variety of ways: 'Cars 2' (Blu-ray/DVD Combo Pack), 'Cars 2' (Blu-ray/DVD Combo Pack with DVD packaging), 'Cars 2 - 3D' (Blu-ray 3D/Blu-ray/DVD/Digital Copy Combo Pack), and a mega 11-disc 'Cars: Director's Edition' (a boxed set that includes 'Cars,' 'Cars Toon: Mater's Tall Tales,' and 'Cars 2 - 3D' plus a Die-Cast ‘John Lassetire’ Car!). Suggested list price for the Blu-ray/DVD combo packs is $39.99, the Blu-ray 3D combo pack is $49.99, and the Director's Edition is $119.99. You can find the latest specs for 'Cars 2,' 'Cars 2 - 3D' and 'Cars: Director's Edition' linked from our Blu-ray Release Schedule, where they're indexed under November 1.